VpCI-136 emitters are unique devices designed to provide corrosion protection for metal components and parts. The VpCIs (Vapor phase Corrosion Inhibitor) emit vapors, which form a molecular layer on internal metal surfaces to protect critical, complex and expensive electronic equipment during operation, shipping or storage. 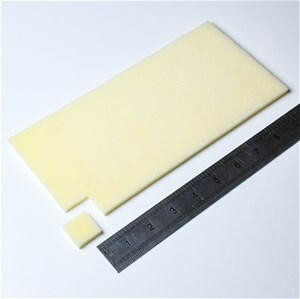 VpCI-136 is a small foam emitter through which corrosion inhibitors are slowly released. Metal parts packaged with VpCI-136 receive continuous protection against protection against humidity, condensation, aggressive industrial atmospheres, dissimilar metal corrosion (galvanic corrosion), salt, air, and residual impurities left after processing. Approximately 1,000 foam squares per carton. Emitters measure 1" long x 1" wide x .25" high. Each foam square protects .25 cubic feet of space. Note: VPCI-136 emitters do NOT have adhesive backing. Cortec Product Code 15003083.